In July 2015, the New Horizons spacecraft dazzled us all with our first ever close up pictures of Pluto, a world which had appeared in textbooks previously only as a speck of light with an arrow pointed at it. However, New Horizons is not done. At 11:33 pm CST on New Year’s Eve 2018 (thus, January 1 on the east coast and in most of the world), New Horizons will fly past a tiny, icy rock nicknamed “Ultima Thule”, a member of the Kuiper Belt. About a billion miles farther from the Sun than Pluto, Ultima Thule will become the most distant object ever visited by a spacecraft. 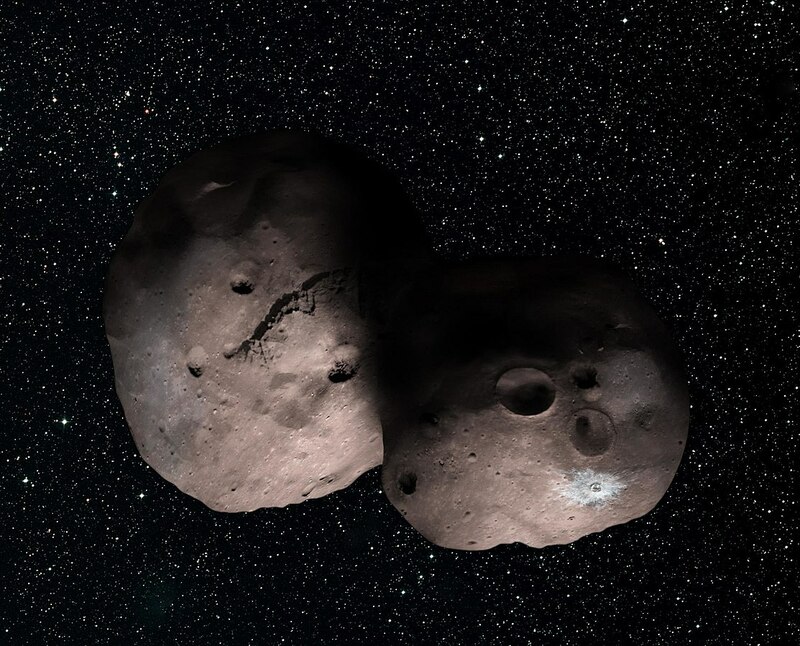 Artist’s Concept of 2014 MU69 (Ultima Thule) as a Binary Object. Author: Alex Parker. Source: Wikimedia Commons. If you are familiar with the asteroid belt, which consists of over 100,000 tiny rocky bodies orbiting between Mars and Jupter, the Kuiper Belt is similar. However, the Kuiper belt is 20 times wider, as it begins just beyond Neptune’s orbit and extends 20 AU (Earth-Sun distances) outward from there. It also contains many more objects, making it 20 or even up to 200 times more massive than the asteroid belt. Also, since the region beyond Neptune is far colder, Kuiper Belt objects are as icy as they are rocky. The Kuiper Belt also includes Pluto. Pluto was ‘demoted’ in 2006 because astronomers kept finding larger and larger Kuiper Belt objects (KBOs) until they found some approaching Pluto’s size. Also, they found that many of these objects have orbits like Pluto’s, highly inclined and in a 2:3 resonance with Neptune. It became impossible to exclude Pluto from this category. 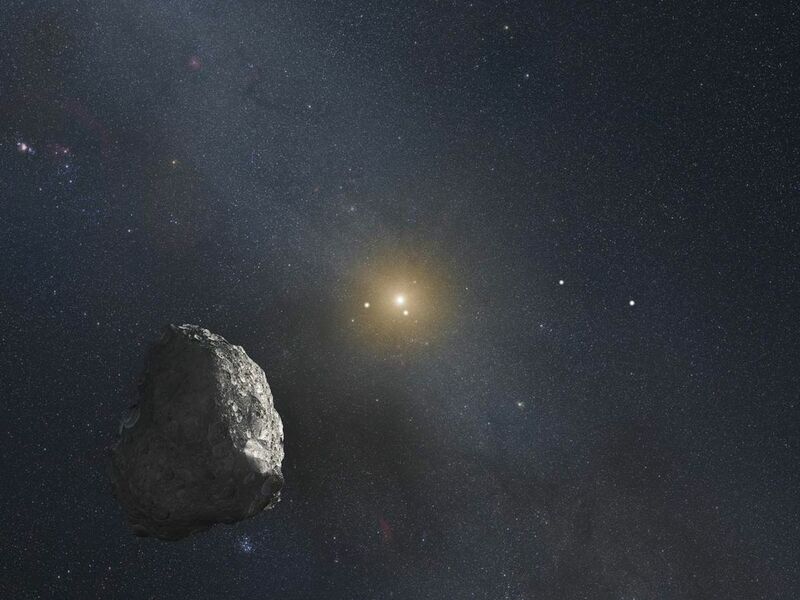 Artist’s impression of a Kuiper Belt object (KBO), located on the outer rim of our solar system at a staggering distance of 4 billion miles from the Sun. Author: Nasa. Source: Wikimedia Commons. In 2011, after the launch of New Horizons, astronomers searched Pluto’s region of the Kuiper Belt for other KBOs that might happen to lie along the spacecraft’s path, which New Horizons might also explore. In 2014, the search turned up an object, designated 2014 MU69, which New Horizons could reach with four small course corrections, requiring only about a third of the fuel left. It is this object that has been nicknamed “Ultima Thule”. (An official name will have to wait until after the actual flyby). Ancient Greek and Roman mapmakers had called the northernmost spot on their maps ‘Thule’ (the ‘e’ is pronounced, not silent). In classical and medieval literature, ‘ultima Thule’ referred to a spot beyond the boundaries of the known world. Astronomers classify KBOs into two main categories based on how they orbit the Sun. One type of KBO orbits much like planets do, following an almost circular path near the same plane where the planets orbit. These ‘classical’ KBOs are often called ‘cubewanos’, since the first one found had the designation 1992 QB1. The other KBOs are in an orbital resonance with Neptune, meaning that they orbit exactly once per two Neptune orbits, exactly twice per three Neptune orbits, or some other such ratio. These have more elliptical orbits which are inclined to the plane where the planets orbit. Pluto is in the second category (it has a 2:3 resonance with Neptune), while Ultima Thule is in the first. 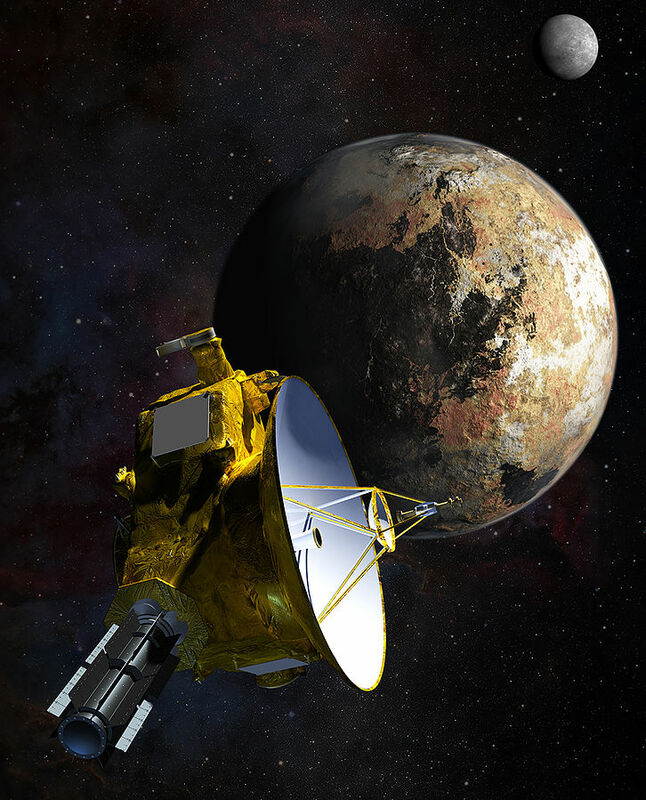 Artist’s concept of NASA’s New Horizons spacecraft as it passes Pluto and Pluto’s largest moon, Charon, in July 2015. Author: NASA. Source: Wikimedia Commons. Thus, this encounter is our first ever close up look at a classical KBO. After watching Ultima pass in front of three different stars in summer 2017, and watching the stars’ light blink out and reappear at different sites, astronomers determined that Ultima Thule has a distinct two lobed shape. In fact, it may really be two objects close together instead of just one! We’ll find out for sure on New Year’s Eve. New Horizons will fly about three times closer to Ultima Thule than to Pluto, giving us a good view of this tiny object only 30-45 km across. We hope for a good look at its geology and composition, providing our first concrete clues as to how it formed and evolved. Does Ultima Thule have a moon? Does it give off a coma as comets do? In what ways is its composition similar to or different from that of Pluto or comets? These are some of the questions we’ll start exploring with real data as 2019 rolls in. And New Horizons has been taking pictures of other KBOs in the area as well. Yes, these others appear only as points of light since the spacecraft isn’t flying next to them, but those points are much brighter than they appear back at Earth. It’ll take most of 2019 to beam back all this data, which will keep astronomers busy much longer than that.